ARTS III is the third generation ARTS and was engineered for NASA DFRC’s Predator-B (Ikhana) UAV #870 aircraft. The aircraft is an experimental platform for NASA’s HALE and Suborbital Science programs. Additionally, Ikhana plays a critical role in the U.S. Forest Service’s WesternStates Fire Mission, which provides real-time wildfire imaging and mapping capabilities in the western United States. A single ARTS III flight unit features a ½ ATR chassis with three single board computers, and a wealth of external I/O including ARINC-429, 1553B, Ethernet, RS-422, and analog. Additionally, each unit has 6 GB of on-board data storage capacity. 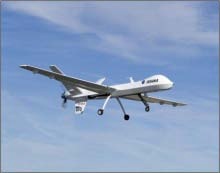 For more information on the Ikhana UAV: http://www.nasa.gov/centers/dryden/research/ESCD/ikhana.html.